Perched nearly 1500 feet above the Linville River, Wiseman's View overlooks the deepest gorge in the eastern US. 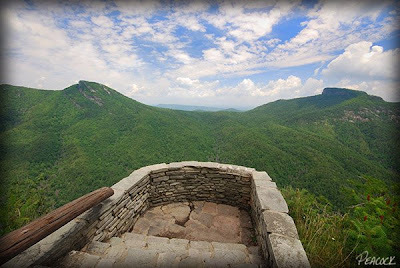 From this vantage point, not only do you get a magnificent view of the rugged Linville Gorge, but you also get a commanding view of Hawksbill Mountain (above left) and Table Rock (right). Click here and here for more information on Linville Gorge. It is also one of the places from which the mysterious "brown mountain lights" can be seen -- click here for more information and other viewing locations. And while you're in the area, be sure to check out the view from Chestoa View Overlook (Mile 320 on the Parkway). 7. A sign will point the way (to the left) for Wiseman's View. From here it's a short drive to the parking area and a fairly easy walk to the lookout points (1/3 mile walk I'd guess). Click here to see an autumn photo of Hawksbill Mountain. Click here for directions and description of hike to the top of Table Rock. More photos here. Thank you Mark. Everything looks so green despite the drought. Great shot of Hawksbills and Table Rock. There is a wonderful pine tree with circular cones named after Table Rock,oddly enough called the Table Mountain Pine. Another wondeful shot! What direction are you looking at from this photo ? (N-S-E-W) I was wondering if this might be a good place to shoot a sunrise shot? Thanks for the great shots and also the directions to some of these great locations! The next time I am up that way, I will have to explore the area some more! If ok, I am adding a link to you blog from mine. Thanks for visiting and for the comments. Harold, I looked on Google Earth and it looks like Table Rock is due east of Wiseman's. I think it would be a great place to catch a sunrise! 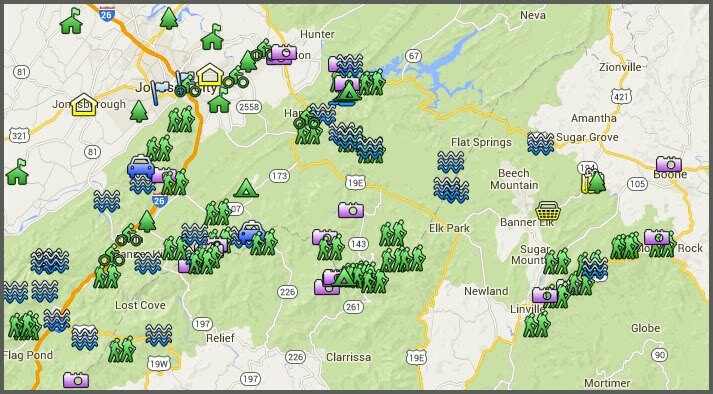 I was wondering if you know of a campsite near Wiseman's view? Bear Den is an excellent nearby campground. Good folks, reasonable rates. There is plenty of places to camp up the gravel road leading there. I went last weekend. I agree with the previous post by anonymous...I have camped there about 15 times...I'd say there are at least 10-15+ sites along the dirt road. Just bring all you need with you, its a bit of a way for any kind of resources in a pinch. I have a question my fiance proposed to me here at wiseman's view and I was wondering how I might would go about trying to get married here, it would be so beautiful and meaningful also! Does anyone have any suggestions or no anyone I could contact in the area by chance....? Thanks! How about that! My fiance proposed to me there also, and we are wanting to get married there also. We spoke to the gentleman at the information cabin and he told us to contact the Grandfather mountain ranger station to inquire....Or, he said, "just do it" it is easier to get forgiveness than permission. He said that we would have to understand that they can't close the view and that we may have a few wedding crashers, but that doesn't sound like such a big deal to me. Anyway, we haven't decided if we are willing to get crashed and shut down by the ranger, or if we will call. If you find out anything, please post. I will do the same. Congrat on the engagement! Question for you engaged couples. Did you end up marrying there? I went there this weekend Sat., Aug.,24, 2013. The sights there are magnificent for the eastern U.S. I am just curious how many different states that you can see. It would be a good idea to take a vehicle that is not low to the ground. When you go up a hill, do not stop. Otherwise, you will throw gravel ,and your wife may have to push. Hi, I have a random question--I followed a link from the Wash. Post to your page because I wondered about the claim that Linville is the deepest gorge. I visited Breaks Park in Va/Ky a couple of years ago, which claims the deepest as well, for the Russell Fork gorge, which according to the topo is 1620 feet. A little scan of Google indicates a few others in competition for the deepest gorge...wondering if you have some insight into this. 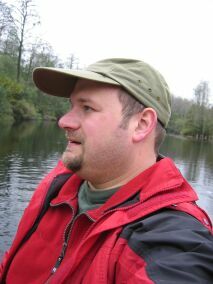 Geeky geography person, I guess. I've noticed the competing claims for deepest gorge east of the Mississippi as well. So I turned to that most reputable source of data, Wikipedia. It says Breaks is 1600 feet deep, Linville 1400. Not sure of the accuracy of those numbers, but it is interesting that both claim the title. Thanks for stopping by! I just wanted to say how much I appreciate this blog. Everyone in this area should realize what a great service you are doing. There is nothing else out there that even compares to the helpfulness and thoroughness of this website. I don't know how I would find things or navigate around the beautiful parts of this area without this blog. I have had many great adventures because of it. Thanks so much for your hard work, selflessness, and this wonderful free service you offer to our area. I am really grateful for it.